Howard County government takes a hard look at its operations to find ways to save energy. Howard County has had success phasing in hybrid vehicles and diesel-electric hybrid buses. These vehicles are reducing fuel use. Howard County has also converted many traffic lights on County roads to LED lights. These lights use 60% less energy than before. Other County facility projects include LEED buildings, installation of solar panels and energy efficiency upgrades. Howard County government has had success phasing in hybrid vehicles into the work fleet and the bus system. It is now County policy to phase in hybrid vehicles for all vehicles in the fleet that have an equivalent hybrid on the market. To date the County owns 50 hybrid vehicles, about 15% of the vehicle fleet. Howard County has the largest hybrid fleet of any jurisdiction in the state. 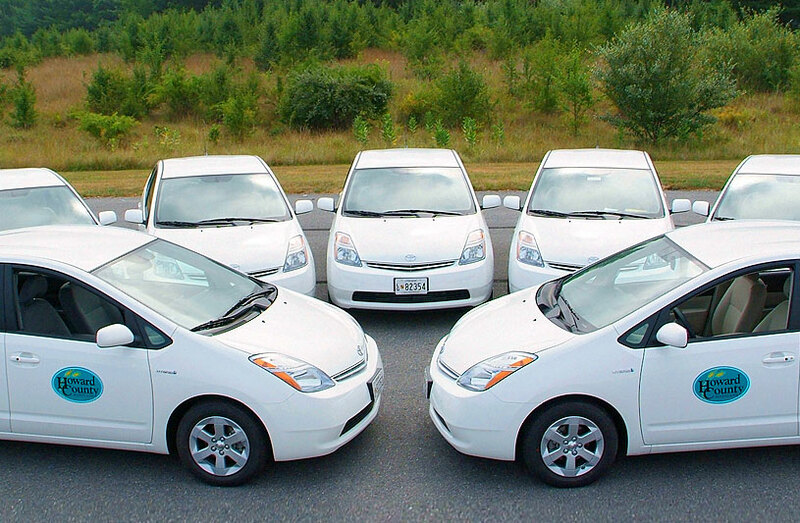 The estimated savings from hybrids is $1,000 per vehicle per year in fuel costs. Howard County also incorporated 2 diesel-electric hybrid buses into the Howard Transit service. The County anticipates that the hybrid buses will reduce fuel consumption by about 35% and reduce maintenance and repair costs by 30% to 50% compared to similar diesel buses. Lighting is one of the single largest uses of energy in Howard County facilities. This is true for almost all building types and uses. The saving from updating lighting and replacing old and broken lights with new, efficient ones can be substantial. Four-foot fluorescent lamps are the lighting “workhorses” of office space. The potential energy savings for upgrading them ranges from about 6 to 38 percent. The County accomplished facility lighting retrofits through its energy performance contract and continues to pursue upgrades with the costs reduced by various grants and rebates. Howard County has converted all the traffic lights on County roads to LED (light emitting diode) lights. LED lights use dramatically less energy than incandescent lights. Based on the first year after the conversion of all 85 intersections, the lights are using 60% less energy. In 2009, Howard County was awarded over $2.6 million in stimulus grant funds as part of the Energy Efficiency and Conservation Block Grants Program. With the help of the grant, the County has implemented many energy efficiency programs to save money and decrease greenhouse gas emissions. Some of the projects included a free home energy audit program, purchasing energy efficient lighting, and purchasing energy efficient vehicles. A service provider identifies, engineers, and installs energy improvements for a client’s facility. A lender provides the capital that pays for the service provider’s work. Energy consumption is reduced because of the improvements and the energy savings are used to pay for the upgrade. After the investment is paid for, the organization continues to save money. An EPC has several advantages, including access to cutting-edge energy technologies and expertise, long term energy savings, and the ability to improve energy efficiency without incurring a large up-front expense. In 2008, Howard County Government entered the first phase of an energy performance contract. The scope of this agreement covered seven County facilities (Dorsey Building, Central Library, East Columbia Library, Recreation & Parks Head­quarters, Detention Center, Gateway Building, Scaggsville Public Safety Center). The County’s energy performance contract for these seven buildings created over $238,000 in energy savings during calendar year 2010. This was an eight percent reduction in cost! Howard County Government and School Board both participate in the Baltimore Regional Cooperative Purchasing Committee (BRCPC) in order to manage their energy purchases. Managed by the Baltimore Metropolitan Council, this procurement cooperative serves Baltimore City, Anne Arundel, Baltimore, Carroll, Harford and Howard counties. BRCPC creates a number of benefits including advice from experts, discounts due to the increased volume of demand, and a hedge against price volatility. To learn more about the ways in which you, your workplace, or organization can be more energy efficient, visit the links below.